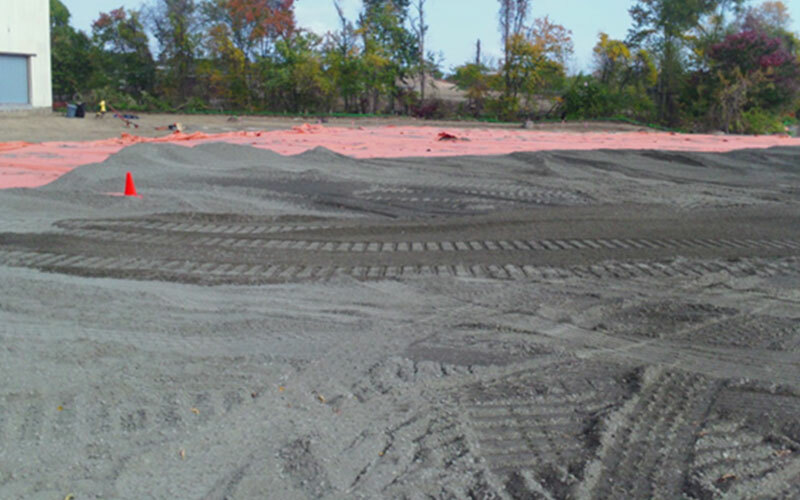 Geosynthetics play a crucial role in environmental soil remediation and redevelopment projects. They can function alone or as part of a treatment system to prevent pollutants from entering the environment. Impermeable geomembrane liners are typically used to line and cover a contaminated soil pile or to provide containment of a hazardous material. Geotextiles function as a filter allowing water to pass through them while limiting upward contaminant migration. Highly visible orange nonwoven demarcation geotextiles printed with the words “Do Not Dig” can be used as a cushion to protect the liner as well as preventing someone from digging and penetrating the cap. Drainage geocomposites provide a pathway for fluids and can be used to construct leachate collection systems. There are a wide range of geosynthetic products on the market today, and choosing the right one can be challenging. What thickness is required? Should I use a reinforced liner? Is a geotextile cushion layer to protect the liner also necessary? Can a panel be fabricated large enough to fit the area? Please contact our sales department at 609-971-8810 so we can help you choose material that is both cost-effective and fit for the application at hand. Geosynthetics play a crucial role in environmental remediation and redevelopment projects. They can function alone or as part of a treatment system to prevent pollutants from entering the environment. Impermeable geomembrane liners are typically used to line and cover a contaminated soil pile or to provide containment of a hazardous material. Geotextiles function as a filter allowing water to pass through them while limiting upward contaminant migration. Highly visible orange nonwoven demarcation geotextiles printed with the words “Do Not Dig” can be used as a cushion to protect the liner as well as preventing someone from digging and penetrating the cap. Drainage geocomposites provide a pathway for fluids and can be used to construct leachate collection systems. Brownfields and Superfund sites are abandoned areas of land contaminated from activities previously undertaken at the site. The Brownfields Revitalization and Environmental Restoration Act of 2001 promotes both the cleanup and revitalization of these areas. Instead of consuming valuable open space and prime farmland, brownfield redevelopment recycles and reuses idle land. This transforms the once contaminated areas into “green spaces” and other recreational areas that benefit human health and the environment. Brownfield cleanup efforts are generally the responsibility of state and local agencies while the Federal government’s superfund program manages superfund sites. The EPA locates, investigates and identifies the worst hazardous waste sites throughout the United States and places them on the National Priorities List (NPL). Property-specific factors such as contaminants and level of contamination onsite will influence the selection of the cleanup remedy and type of control measures. Traditional methods of excavating and hauling contaminated soils off-site for treatment and disposal can be costly. Some projects allow for the contaminated material to treated on site and/ or contained in place. The use of engineered caps, mitigation barriers and collection systems restricts exposure and eliminates further migration of the pollutants off-site. Impermeable Caps: A multilayer system of geosynthetics that includes an impermeable geomembrane liner, a geotextile cushion and/or separation layer and sometimes even a geocomposite drainage layer. They work together to prevent water from infiltrating downward and leaching contaminants into the groundwater or surrounding areas. as surface barriers or caps over contaminated soil. The low permeability cap prevents surface water infiltration and stabilizes the movement of contaminated soils. Permeable Soil Caps: A portion of the contaminated soil is excavated and removed. 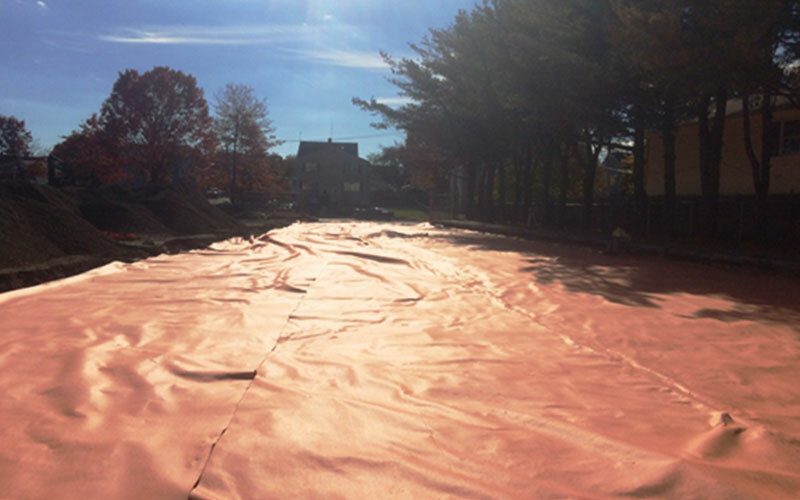 An orange demarcation geotextile fabric is installed prior to backfilling. It acts as both a barrier and a filter, allowing water to pass through while limiting upward contaminant migration . The area is then capped with 2-3 feet of clean fill soil for non-residential uses and 10 feet for residential uses. The orange demarcation fabric can be printed with the words “Do Not Dig” to warn future excavations of the presence of a contaminant. The system directs and collects the contaminated leachate, transporting it offsite for disposal. The use of drainage geocomposites or geotextile filter fabrics construct a pathway for fluids to move. Constructing vertical barriers cuts off the route and prevents the migration of contaminated groundwater or leachate from a property. Geomembrane liners can be used alone or in conjunction with other technologies such as slurry walls to form an underground containment barrier. The installation of a vapor barrier under buildings can minimize potential migration of volatile contamination to indoor air. Multi-layer geomembrane liners serve as innovative gas barrier solutions. They prevent dangerous gases, including VOC’s, from migrating to the surface and into our environment. On-site remediation can typically involve the addition of binding agents to an area of sludge or wet soils. Repeated in-place mixing with the bucket of a backhoe or excavator stabilize the soils in place. Locking the contaminants into a structurally sound mass of solid material for capping is the goal. IWT Cargo-Guard recently supplied multiple erosion control and geosynthetic materials for a major soil remediation project in Bridgeport, Connecticut. The contaminated area was excavated down to an acceptable level and the hazardous soils were then transported off site to a disposal facility. The project specifications required a high visibility demarcation layer or delineation layer to be installed to separate the contaminated soils from the clean soil. However, this layer still needed to allow water to pass while also serving as a visual barrier for future excavations. Originally, the Engineering firm specified a standard 12 oz. nonwoven geotextile fabric covered with a layer of orange construction fence to provide the demarcation. This double layer system was not ideal due to labor costs. After working closely with the contractor, the Engineering firm, and the manufacturer, IWT Cargo-Guard decided that a special 12 oz. highly-visible Orange nonwoven geotextile demarcation fabric was the solution. The manufacturer, Propex Geosolutions, was able to run this special fabric eliminating the need for the construction fence and the extra layer of installation while still meeting the Engineer’s requirements. While working closely with all parties involved, IWT Cargo-Guard was able to come up with a demarcation solution to reduce labor costs while providing a product that performed up to the stringent standards of the project. To learn more about these products or how we can help with your project please contact our sales department at 609-971-8810.